Being blonde is high maintenance but that doesn’t mean it has to be hard work. Here at Grow Gorgeous we’ve done all the hard work for you and all you need for dazzling blonde locks is our 12-in-1 Cleansing Conditioner Blonde. Deep cleansing and deep conditioning, it leaves your hair feeling strong, lustrous and soft, whilst hair’s added shine reflects the light to enhance the color of your blonde tresses. Injecting moisture and thoroughly cleansing each and every strand of hair is achievable with this miracle multi-tasker that adds shine and volume while keeping frizz and flyaways at bay. Gentle enough for daily use, this sulphate-free formula adds incredible volume and helps hair health for longer, stronger hair with a bright and luminous shine. Hair Type: Stressed-out blonde locks in need of strength and shine. I love love this conditioning shampoo. All I need is this one product to keep my roots at bay for the most part, and it's an all-in-one. I bought it to see if it would let me skip a month of root coverage and it works for me. I've been using this for a week and I love it. I noticed a change in my hair in 2 days. My hair seems much happier and seems to be taking its natural healthy shape (slight waves). Minimal, if any, frizz and no damage. My hair's the healthiest its been in years. So happy to have discovered a product that keeps my pale bleached blonde hair shiny and manageable, and not looking like dog fur. I've recommended it to a friend and she loves it too. I've always been skeptical about Cleansing Conditioners and only using one product in the shower to wash my seemed unnatural, but now I'm a total convert! My hair is quite greasy but can get really knotty, so even though I shouldn't use too much traditional conditioner I have to to get a brush through it after a shower. My friend recommended this product and I fell in love after the first use. After use it leaves my hair soft yet clean and it stays greasy free for a least 48 hours after (this used to only be around 12 hours)! Plus it smells amazing!! I bought this Cleaning Conditioner for the first time about 6 months ago and really love it. 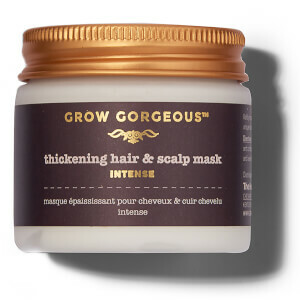 I have very fine but thick natural blonde hair that breaks off and tangles very easily. With this product my hair does not tangle and is much easier to brush (leading to less breakage). This shampoo allows me to wash my hair less and my hair is light and full rather than flat and dull. I wash every other day, I use Farouk chi pearl complex on my ends, and use a clarifying shampoo once a week. I have not found a better hair product and will be trying the density shampoo/conditioner soon. Thanks Grow Gorgeous! First time Grow Goregeous buyer and this is a great conditioner for me,I use it every other day and it feels very nice in the hair.